The Oplink Security TripleShield Wireless Security System is a DIY wireless security and surveillance system. It comes with 2 IP cameras to see what is going as well as motion sensors and window/ door contacts to detect break-ins and other coming and goings. It is a self-monitored system you monitor with your smartphone. It works with your router to send notifications and videos to your phone. You can also watch a live feed from the cameras. You can easily install and set up the system yourself thereby avoiding the cost of installation by a third party and having that third party coming into your home. The sensors and cameras communicate with the control panel wirelessly so there is no need to run cables through the walls – saving cost, time and mess. Installation and initial set up of the system is quick. It can be done in less than hour and the manufacturer suggests only 15 minutes is needed. Everything is programmed to work together and all the components required to install are in the kit, including the ethernet cable, double sided tape, other installation hardware and batteries. The system does require to be plugged into your router to work and works best with a broadband connection and you’ll need a smartphone to set up and control the system. There are few DIY skills or technical skills required to get this up and running. You need to be able to operate a smartphone and download an app and navigate around the app which is easy to use. Also you need plug in the control unit (Oplink processing Unit) into the router and power and then you are set to go. The instruction are short and easy to follow. The DIY steps are to work out where you want to locate the sensors and cameras and install them. The sensors are attached using double sided tape. The IP cameras can be placed on a shelf or screwed into the wall using the screws provided. The double sided tape appears to be strong enough to hold the sensors in place as there have not been any issues reported by customers. There is no contract needed to be signed to use the system. But to unlock the functionality of being able to look at recorded video clips online with your phone and have more people than 2 you are required to pay a monthly fee. This is paid by the month and can be cancelled at any time without having to pay a cancellation fee. (The Piper system (see more here) does give you this at no extra cost but the camera does not have night vision and the iSmartAlarm (read more here) also gives you this). There are 3 levels of monitoring available, with 2 of them requiring a monthly fee to be paid which can be cancelled at any time. Standard – this comes with the system and is free. This allows you to have 1 owner and 1 authorized user, as much video streaming as you want, you can arm and disarm remotely, get push notifications to your app, and email notification to the owner with a snapshot of event. This excludes the ability to see a 30 second video on your phone of the security event that triggered the notification but you can get a live stream of your home. The video clip is stored on the flash drive which you can view when you get home. You can control up to 12 sensors. Premium – this costs $19.99. When you get the system you may get a 30 day free trial to try it out. After this period you have to pay to continue to keep the functionality. In addition to the Standard functions you can add up to 5 authorized users and up to 5 emergency contacts, get a videogram sent to your phone (a 30 second video clip) of a security event, SMS alerts to emergency contacts, voice call option for Authorized users. This service covers up to 8 video cameras and 24 sensors. To add up to another 5 users, 2 cameras and 12 sensors you pay an extra $10 a month. The maximum sensors you can have on one Oplink Processing Unit (OPU) is 72. Add On Service – this costs $10 a month. This is for cellular back up for use when the internet is down so the system can communicate with the owner, authorized users and emergency contacts. A Verizon 3G modem also needs to bought separately to use this functionality. They have better customer support hours then many of their competitors. There hours of operation are: Mon.-Fri. 9am-7pm, Sat.-Sun. 10am-5pm Pacific Stand Time. This should mean you can contact them outside you work hours if you have a problem or issue that requires sorting. They can be contacted by phone, email or live chat. There have been issues when first launched that appears now to have been sorted and there is now considered very responsive and helpful. 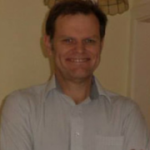 When I contacted them for further information for this review they were very responsive and came back very quickly with good answers to my long list of questions. The package discussed here includes 2 IP cameras. They are for the indoors use only. The cameras work during the day and night. The night vision is in black and white and during the day it is in color. The images during the day are pretty good for this type of camera but the night vision is grainy and you won’t be able to identify someone unless they are standing close to the camera. The cameras appear to have an effective range of between 20 to 25 feet. To improve the night vision you can set up with an automated light that comes on when motion is detected – this needs to be bought separately from a third party as Oplink automation functionality do not provide this type of functionality. The image resolution is 640 by 480 and it has a 66 degree angle of view. This view is fixed (you can’t pan or tilt or zoom)so you need to decide the best location when installing to get the best unobstructed view but the camera can be swiveled on its mount to adjust the view or you can move it to a new location if you wish. The cameras include a 1 way speaker so you can listen in to what is happening in your home but you can’t speak to the room. It can be a good way to see and hear what your children up to while you are at work as well as listening and seeing what is happening during a security incident. You can set a camera to look outside through a window, although this won’t work particularly well at night due to reflections from the window. There is an adjustment you make through the App to allow for the extra brightness during the day so that you still get reasonable video and not just a faded washed out video. The motion sensor sensitivity can be turned down so that it does not detect your pets so you won’t get a notification every time they walk past the camera. There is a sliding scale of 0 to 100 with 0 being the least sensitive. You need to play with this get it right so that it ignores your pets but still detects movement of humans. The setting of 0 is effectively off. The cameras will record a video when the motion sensors and window/door contacts are triggered in the same way the motion sensor does on the camera. You can buy other packages that come with no cameras, 2 cameras or 4 cameras for example the Alarmshield kit (that is listed with this one on Amazon) does not include cameras. When there is an event the camera records a 30 second video clip (company calls them videograms) which includes 5 seconds before the incident and 25 seconds after the incident. A notification is sent that there is a video and you can view this over your smartphone. The video clips are stored on the 16GB flash drive included with the system and after 7 days the videos are overridden by the latest videogram. The flash drive can store up to 600 – 700 videos before it is full. These video clips can be viewed on your PC by plugging the flash drive into your PC USB port. You can do this with the free service as well as the Premium service, however this may change at the company’s discretion. The videograms can also be stored on your PC for storage if you want to keep them for a longer period . Any adhoc live recordings that you initiate from your phone are stored on your phone in the photo gallery if you want. No videos are stored online in the company’s cloud server. The siren is 110 db loud which is the equivalent of a motorbike in your home It will be disorienting and in many cases this enough to persuade a criminal to leave as they don’t want to be seen. You plug this in and mount on the wall near the power supply. It makes a beeping sound when triggered and gets steadily louder until it reaches 110 db. The siren sounds for 1 minute when it has been triggered. The sensors reset themselves after 3 minutes, so any movement during this time does not record as an event. The system notifies you via the internet and the company’s cloud server. It will send you a notification by push notice and email and there is an audio alert to let you know that a notification has been received. It can also phone you which is handy if one of your emergency contacts and/or authorized users does not have a smartphone and can’t receive emails or push notifications. If no-one has responded and checked the system a further notification will be sent out to the emergency contact list after 5 minutes, after this no further notifications are sent out. The notifications will let you know the details of the sensor that was triggered and if there is a videogram (a 30 second video clip to view) you get an audible push notification letting you know that there has been an event. If you accept the notification the app is launched and you are taken to Videogram section and you can see the snapshot and watch the video. You can save these to your phone for future reference or share with other users. Currently there is no service for third party monitoring and you are responsible for making the decision as to whether to contact emergency services when there is an incident. You monitor the system using your smartphone. The system currently supports iOS, Windows and Android devices. It works with iOS 6, Android 4.0, Windows 8 and later. This is a free app. It works any place you can get internet access from your phone via wireless or cell data service. It is a simple app to use and you can monitor multiple systems and cameras within the one app. For the free service you can have one owner and 1 authorized user. With the paid Premium service you can have up to 11 users – 1 owner, 5 authorized users and 5 emergency contacts. To add up to another 5 authorized users or emergency contacts you are required to pay another $10 a month. The owner and authorized users can arm/disarm the system remotely, view video clips and stream live video. The emergency contacts only receive notifications of the event. The owner is the only one that can make changes to the system settings. The system is designed to be monitored by your smartphone but you can also do this via a PC by logging into your account at web.oplinkconnected.com. It is not as good as with your smartphone but is okay if you don’t have you phone with you and want to access your system. When using the App you can view up to 4 cameras on one screen or chose to watch one at a time and switch between them. You can record up to 30 seconds of video at a time and you are given the option to share with other users by email of Facebook connect. You can save the video to your photos director on your phone. When using the free service to view video your viewing is interrupted by an ad every 5 minutes, to continue viewing you must close the ad. The siren, cameras and OPU all use the house supply for power. The siren does have back up batteries so it continues to work if there is a power outage. The siren uses 3 AAA batteries as backup. The lack of battery for the OPU is a big issue as when supply is cut the system is no longer securing your home or business. The batteries needed for the sensors, contacts, siren and remotes are included when you buy the system. The motion sensor and doors/window contacts each require 1 CR123A battery to work. These batteries are readily available and you can get a pack of 8 Duracell batteries for around $17.00 on Amazon at currently. The system will let you know that the battery requires replacing. The remote controls use a CR2032 coin style battery. They are readily available and cost about $4.00 for a pack of 5 on Amazon. The batteries should last about 2 years. The motion sensor is a passive infrared sensor and works by detecting changes in body heat. It has a 120 degree view and can detect movement up to 40 feet away. It is best installed in the corner of a room to get full coverage with no blind spots. As with all of these types of sensors hot temperatures and air conditioners and heaters can affect the performance of it. These are a 2 part sensor that is made up of a magnet and sensor. They work on any window or door that opens – it doesn’t matter if it slides open or from the bottom or at the side. When the door or window is closed the two parts are next to each other and when the door or window is opened or forced opened separating the parts by more than 25 mm the alarm is triggered. There is a panic button on the remote control fob. This is used when there is an emergency and you want to trigger the system instantly – the siren sounds and notifications are sent out – such as when you discover a fire or an intruder in your house or there is a medical emergency. If your house is broke into while you are there you may be forced to disarm the system. As this is a self monitored system and uses a smart phone app to disarm there is no way to turn the siren off and send a notification to other users that this has been done under duress. 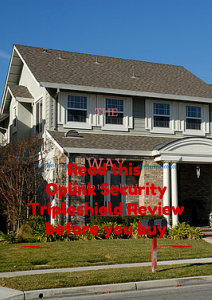 There are 2 ways to arm and disarm the Oplink Security Tripleshield system. It can be done with the App or remote control fob. The remote control fob works up to 50 feet away from the Oplink Processing Unit (OPU) and you can arm or disarm the system while outside the house. The App does this too. But the app gives you the option to arm in stay or away (the remote control fob only allows you to arm in away mode). In stay mode it activates the door/window contacts and leaves the motion sensors off so you can move around the house freely while at home without triggering the alarm. The owner can also schedule times for when the system is armed or disarmed using the App. This system does not have a control panel. Instead it has a unit that is programmed using your smartphone called Oplink Process Unit (OPU). It communicates with the smartphone and the sensors as a control panel would but it does not have buttons to press to control, set up and monitor the system. The OPU unit has two aerials for communicating with the sensors, cameras and smartphone. These are situated at the back of the unit. Also on the back is where you plug in the Ethernet cable to connect to the router and also the power cable. Modem (this does need to be bought separately and there is a monthly fee for the service) to provide cellular backup in the event of the internet being down. On the top of the unit there are 4 LED lights that indicate the status Power, Cloud, Devices, and Armed/Disarmed. There is a speaker on the right hand side that beeps to let you know when the system has been armed or disarmed. The smartphone App you use is easy to use and is highly rated for its functionality. This is where you make the changes to the set up, add users, delete users, watch videos, share video with other users, read the event log and arm/disarm the system. The first screen is the main menu taking up all the screen. It is a multi-colored rectangle split into 4 parts to cover – video, videogram, automation, armed/disarmed. In the upper left corner is a menu icon that when pressed gives you the options to access the web store, manage devices, add/delete authorized users and emergency contacts, look at the long of events, make changes to notifications audible, non-wifi alerts (you can turn this off to save data usage and costs) and push notifications, and make changes to your personal information. Device management allows you to add, remove and rename devices including the OPU. When you open the device you will be given a notification if there are any low batteries that require changing along with the name of the sensor. The automation option on the main menu allows you to control home automation devices in your home by switching them off and on remotely. At the moment there is no delay functions in the system but this may happen in an upcoming release of the software. The system is armed instantly and there is no grace period for leaving or entering the premises. You need to arm and disarm the system from outside the premises. You can buy a 3G Verizon modem for cellular back up for when your internet access is down and pay $10 a month for this feature. The siren is powered by the house supply but has back up batteries so they can continue working if there is a power outage. However, as the OPU does not have a backup battery if the power is cut the system does not work. There is a safety measure that if there is no communication between the cloud servers and the OPU unit you get a notification that your system is offline. It may not protect you from being turned off but you know if there is a problem and can take action, such as asking someone to check your home if you can’t do it personally. (it pays to be on good terms with your neighbors). The devices need to be within 50 ft of the control unit to work effectively. This distance can be extended by installing the company’s Oplink wireless repeater. This can extend the distance by another 100 ft. Although no one has mentioned this, it seems to me that 50 ft is not going to be enough for larger homes and the repeater is going to be required to get good coverage for these homes. if wThe communication between system components is wireless using 433 Mhz frequency so it should not interfere with your internet wifi. However, it is important to note that the cameras, the OPU and siren are plugged into the house supply to power them. Also, the OPU is plugged into your router to be able to be connected to the internet and your smartphone. A dongle can be purchased separately and plugged into one of the USB ports on the OPU to connect wirelessly to your router if your prefer not to run an ethernet cable from it.ireless on what frequency? The devices can be individually renamed, so you can use this to identify the device that has triggered the event quickly and easily. The devices are not added to zones and at this stage there is no functionality to change how each device acts when the system is armed in stay or away as you can with most systems with zone functionality. This lack of flexibility could be limiting when you want to arm the system in home mode. You may want one of the doors not to trigger the alarm but only send a notification if you know it may be in use while you want another door that you know won’t be used so you want that it to be fully armed. 1 OPU – this is the communication pathway between the devices and the app via the internet router. It communicates with the system devices wirelessly. Smartphone App – there is a free App for Windows, Android and iOS and this is used to control and monitor the system. It is downloaded from the relevant App store. Currently there are no smoke alarms or CO2 detectors available but there is a sensor for detecting when third party alarms are sounding. Limited home automation features as you can only turn lights on and off remotely. You can’t set them to turn on when motion is detected or at scheduled times. The motion sensors are not pet sensitive and cannot be adjusted to ignore them. Current reviews for this system are positive with people liking the ease of use of the App and how quickly you can get the system up and running. The video quality during the day is liked but the night vision is only rated okay with it being fuzzy and it would prove difficult to recognize someone. The main dislike is that you have to pay monthly for the functionality of getting video clips to your phone and it costing to add more than 2 people to the App to be able to access the system. The upfront cost for the system is reasonable considering you get 2 cameras as well as sensors. IP cameras can cost upwards of $199 each. However the monthly costs are high for what you get compared to other systems. For the $19 (at time of review) a month you get to watch recorded video clips and to add up to 11 users to the system and up to 24 sensors. I would expect to see more functionality including cell back up (which is another $10 a month). Much of this functionality you get with these monthly fees is included in the package price for Piper and iSmartalarm (although the video quality is not as good as what you get in this system). This package is probably enough for an apartment but for a home it is a starter kit and you are going to want to add more window/door contacts to cover your home and more motion sensors. If you wanted 10 door/window contacts to cover your 1st floor and 3 motion sensors to cover down stairs and access to your bedroom the total cost is going to be over $560 (at time of review preparation) but that does include two good IP cameras. This system is very good at what it does and if you want surveillance with your security system it makes for a good choice based on experience of actual customers as stated in their reviews. There is no contract needed to be signed and the fees are paid monthly and can be cancelled at any time without penalty. This does all add up but you do get additional peace of mind that you can keep an eye on your home and be notified quickly if something is going on. The other concern I have is that this is a relatively new system and company so does not have a long track record as you get with other systems such as Simplisafe or Honeywell.